A year ago our garage was like most. Stuff piled on top of stuff, who knows what's under what. Dust, dirt and grime. Basically organized put a plethora of automotive, gardening, sports, whatever. 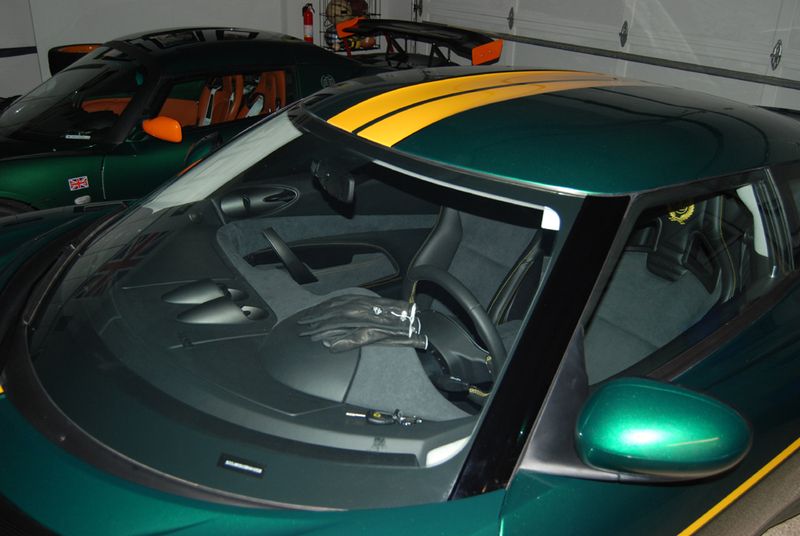 When the deposit was put down for the Evora it was time for a change. So we changed most everything. New flooring, paint, cabinets. 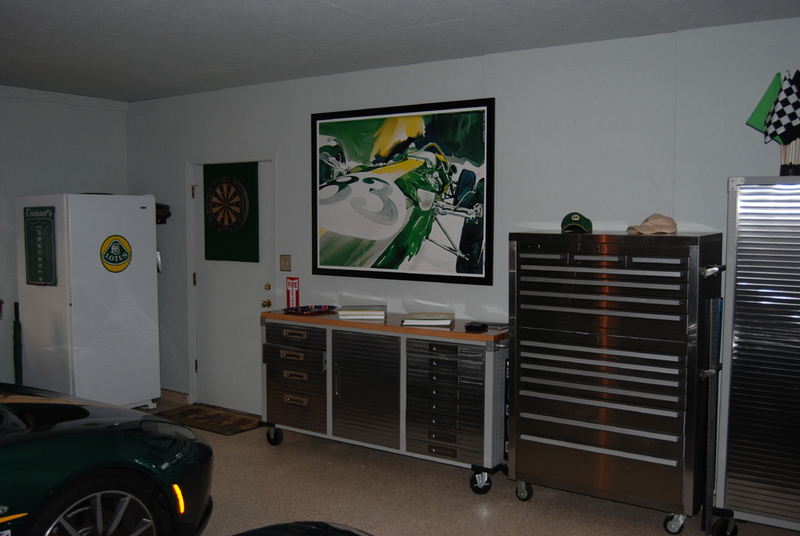 I always wanted a garage with framed art and memorabilia on the walls. Room for the track stuff and tools and parts, but mostly concealed. Very accessible, but easily put away. 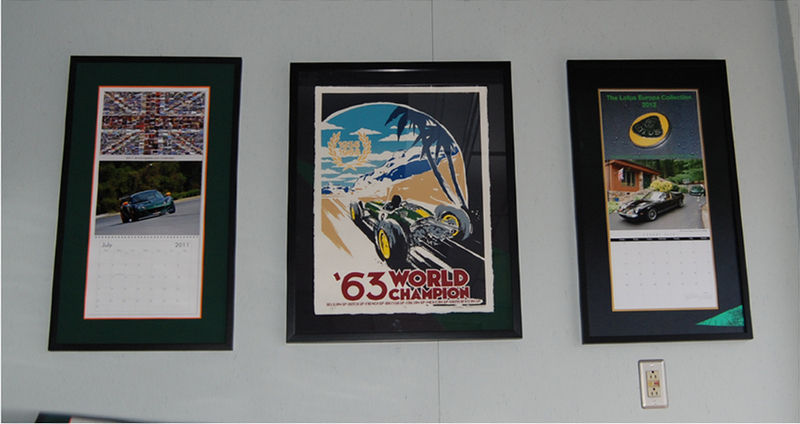 The finishing touch will be a proper portrait of Colin Chapman just to the right of the Pardo (per my avatar). Still looking for a proper high resolution image. Looks good,you have a before shot? Here's one that gives a hint of how it was. Also, this was when the Europa was featured there. Very nice. That's my goal too. I know it's a small detail but I like the way you painted the garage door rail supports on the ceiling white. Much better than galvanized angle iron. We just moved to a new (to us) house that has one, count 'em, one 110V outlet on the wall in the garage. First priority is to get some 110V and 220V outlets, then rearrange. Nice Job. Like the cars. Like the JC gloves. Really like the painting you use for your avatar. It would look good in the Barn. Everytime I try to get my garage set up and tricked out, I realize that I have 3 boys - 8 year old twins and a 2 year old. Translation: my garage exists for their sh*t!!! My father in law has the ultimate set up. They are loaded and just built a beautiful new home on about 5 acres in Michigan. Has a fish/frog pond and amazing rock wallscape/waterfall and pool with the deck/built in grille/etc. He's got a seperate garage 'building' that matches the home and pool house exactly - the grey cedar shakes with white trim and stone. Anyway, said building has a 3 bay garage on the bottom. Two of the bays are for his old cars (he's a Michigan guy - so an older Vette and a '52 Chevy he's restoring). 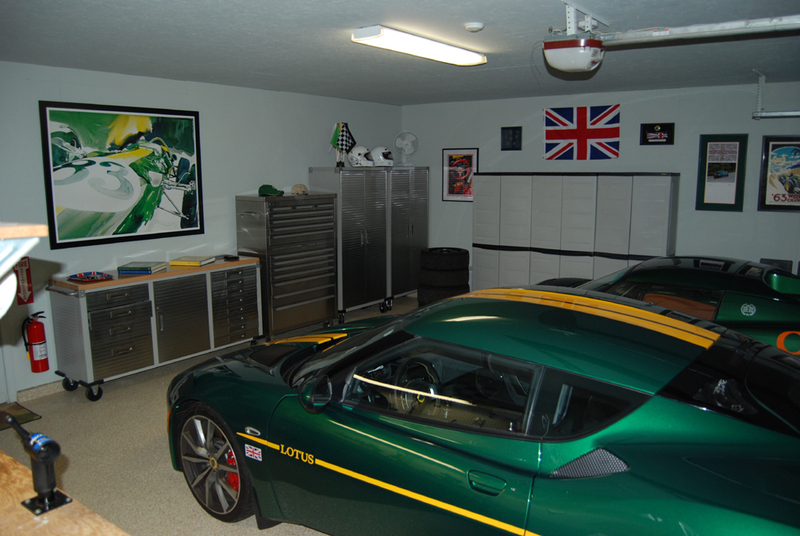 Garage area is heated with the epoxy floors, built in cabs and slat wall. The other bay is walled off and insulated and is his workshop - built in vac system, heated, lights, etc. That's the ground level. There's a beautiful wrought iron staircase outside that goes up the 'loft area' which overlooks the cars. Man cave - his office, bookcases, sectional and huge as LED hometheater set up. Even has a little kitchenette and 1/2 bath. I accept your hate and raise it to envy for those with the mega and multi and separate garage areas. My son is now 14 so you just never know if a tool or roll of tape or whatever might be there when you open the drawer. Getting better though. I've a basic house with a single two car garage. No room for a lift. No plan to ever leave it or build on other space large enough to hold more cars. Few years back we did some remodeling resulting in a 18' square heated storage room. 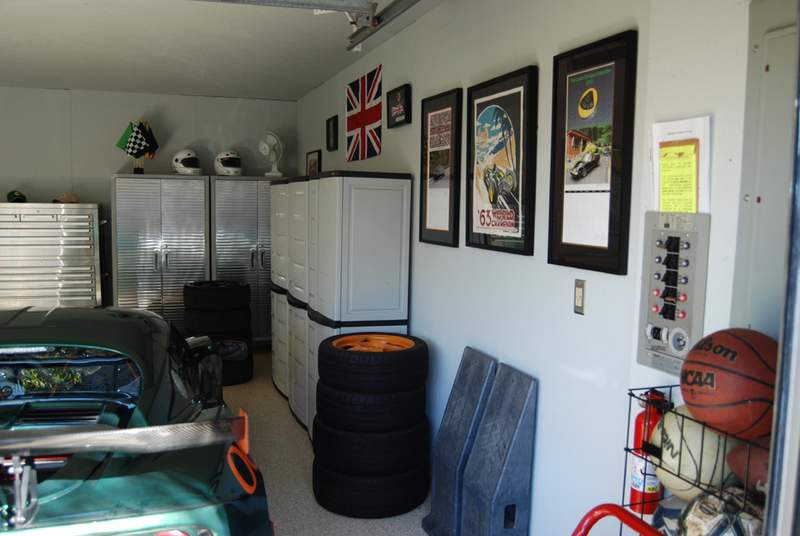 That made it possible to clear out a lot of stuff and make a more organized and pleasing dedicated car area. But in a couple of years I'll probably need to do some grading to make room for my son's car. And then there's his friends. Girlfriend(s). Their friends. Maybe a big lock for MY garage. Absolutely awesome. Really great job! 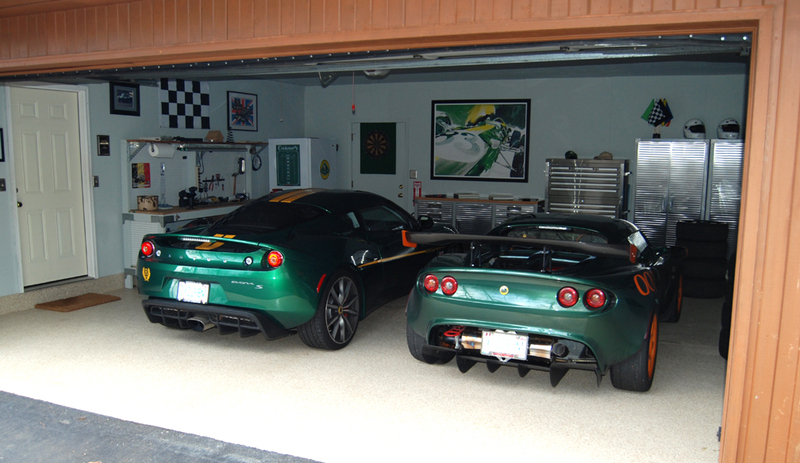 I can't wait to get a real garage after I move out of my condo. Sure it has underground parking for 14 cars but not all the spots are mine! Nicely done. 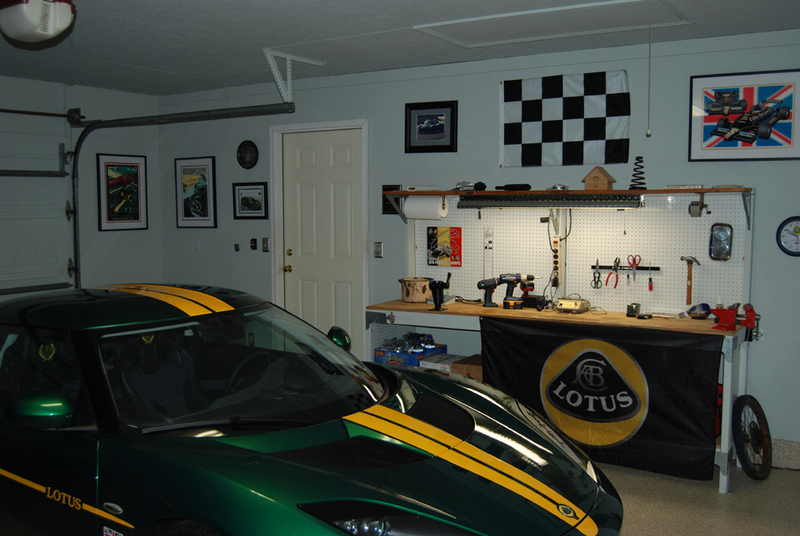 If I were to ever manage to get a picture of my garage in this condition, just outside of the frame there would be a giant pile of bikes, trashcans, lumber, drywall, landscaping equipment, unused exercise gear, etc. Sure it has underground parking for 14 cars but not all the spots are mine! 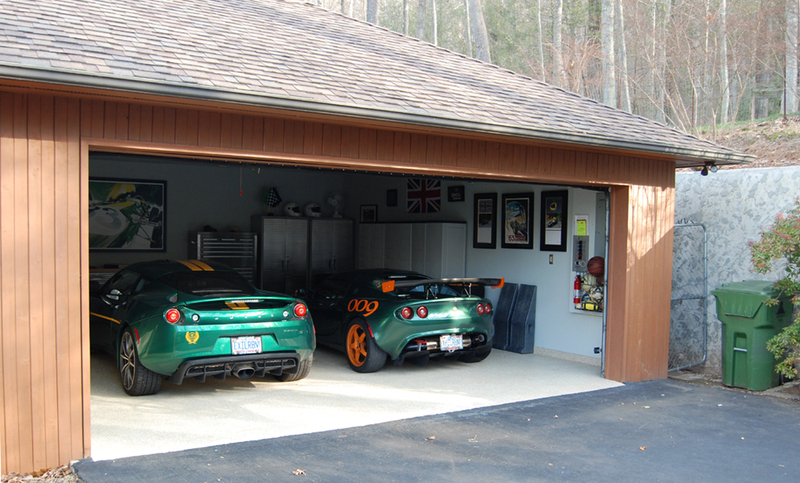 XHILR8N!, the next time I'm out your way I'd love to see the garage, and its inhabitants! Nice change. Looks great. Hopefully when I buy a house it will go straight to looking like that. Love to have you. Blue Ridge Parkway is just a couple miles away. We have a nice 20 minute loop with Interstate and Parkway to feel the various aspects of our cars. Very nice job looks great! I think you have plenty of room for a lift. If you have 9 1/2' or more hight it will work. I only have 9 1/2 ' floor to ceiling, it works fine. All I had to do was move my garage door up. Would you be interested in adopting a 41 year old? really nice! thanks for the motivation to get mine in order. actually i have a two car car port that i need to transform into a garage first! -future thread. 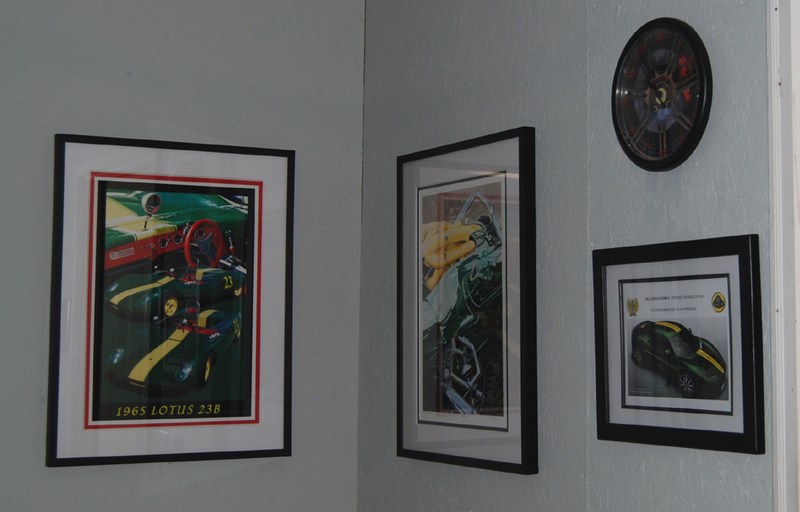 car dudes: don't forget about bulletin boards! they are great for to-do lists, smaller pictures, etc. Nice group of cars Ron. 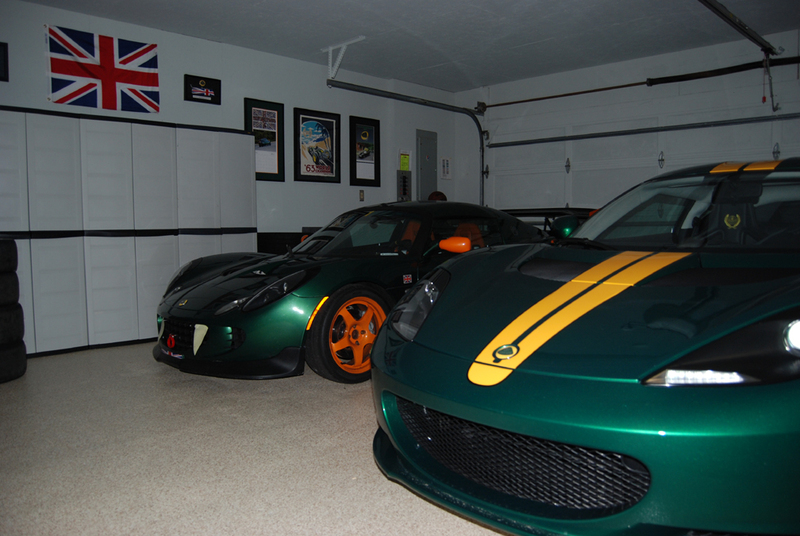 I'm especially impressed that the XKE is placed above your Elise! Wet drive way sure adds to the pictures. Bulletin board! Knew I forgot something. I had a dry erase board to list projects, need to put it back up. I only have 8 1/2 feet height. Maybe the little cars make it look bigger? Otherwise I would still have room for one of the nicest Europas in the country. Still keep up with her though. Very good chance we will meet again at LOG Tampa, as she lives there now. Last edited by XHILR8N! ; 01-27-2012 at 03:01 PM.